When the rumours emerged on Wednesday evening of Manchester United’s supposed interest in West Ham’s Marko Arnautovic I, like many, was left bewildered: Yes, ex-United manager David Moyes transformed him into a new player but, with all due respect, United is a new level altogether. At 29, with the previous history with Mourinho and a reported £50M price tag, it just doesn’t add up. Isn’t it amazing what half a good season can lead to? Arnautovic was deemed a flop at West Ham as recent as January and, if reports were to be believed, he was nearly out of the door there. He was not even playing striker at that point, so to be earmarked as a potential foil for Romelu Lukaku strikes me as an odd one. It got me thinking… If United are truly seeking a backup striker, they are looking at the right team, but the wrong man. Look no further than Javier Hernandez. This is a man who Jose Mourinho openly and publicly claimed he would not have sold were he United manager earlier. I am of the belief that every team needs a man of Hernandez’s quality — a fox in the box, whose currency is goals and more goals. He is well versed to life at United and making vital contributions when needed off the bench. It is a role he has had to live to accept at West Ham, with Arnautovic rightly taking the majority of the glory as the main man there. Granted, he would not be gaining anything as far as game time is concerned, but the chance to come back to United would be difficult to resist, given his popularity. He would offer an alternative to Lukaku in that there would be not so much reliance on hold-up play as such. United would go back to a previously familiar style of getting the ball in the box and if you’d want it to fall to one man, who better than Hernandez’s eye for goal? £50 million for a backup striker just goes to show that football has gone mad to the point of no return, but you can bet your bottom dollar that Hernandez would not cost anywhere near that much. 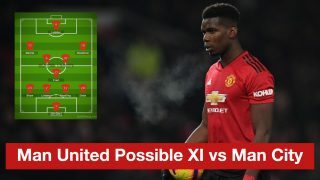 Neither Marcus Rashford, nor Anthony Martial have showcased their credentials on a consistent basis to justify playing a central role more often, which might give you an idea of why a backup striker is seemingly on Mourinho’s agenda. It is probably as remote as a Liverpool trophy, but could Hernandez be the answer?